Kellie Geres: For always being a friend and awesome listener. For being one of the best “nannies” I know and look up to. Your hard work for the nanny industry via Regarding Nannies, Nanny Trainings and so much more is awe inspiring and motivating. THANK YOU! Alice Shaffer: Your friendship means alot to me. What you bring to the nanny industry through Regarding Nannies, INA and your teamwork with ADCAN in the past has been a valuable to me and greatly appreciated. THANK YOU! Beth Lehman: Thank you for Bazinga! He is a joy to have with nannies and their charges. Your work with/for children is amazing. The Nanny community is lucky to have you. Thank you! Sue Downey: Your creation of Nannypalooza is amazing and you have done such great things. Making so many workshops available to help Nannies be the best they can be. To share with us your knowledge through your podcasts is great. THANK YOU! Marcia Brown Hall: Thank you for making your Webinars. They have been very informative and helpful to me as a nanny. I have been in this career for 26 years and yet I have learned some new approaches on job searching and interviewing and then starting that job off right. Please keep them coming! Suzanne Herrick: What can I say- you are a great friend and an amazing nanny! Your seemingly endless supply of energy when caring for C astounds me. You will be great with C2 when she arrives soon! Thank you for your work with ADCAN! Sharlotte Beecher: You are a wonderful nanny! You handle those munchkins with love! ADCAN is grateful for your help with greetings! Thank you! Hayley Smith: I am so very glad to have had the opportunity this last year to get to know you as a friend and a truly awesome nanny! Your nanny families are so very lucky to have you! I love “Hayley Boot Camp”. You as a person and nanny, I admire and say THANK YOU! THANK YOU! THANK YOU! To all my fellow nannies- You ROCK! Keep pushing on even through those days your not sure you can! It takes a village and we need to keep being the best we can for “our” kids! Keep trying to learn new things and talking to other nannies and doing a great job! There are so many nannies I would like to thank, the list would go on for days! To all nannies, I wish you a week filled with love, laughter, unexpected Thank You’s.To Alice: Thanks for being the other half of Regarding Nannies. We make a great team!To Karen: My BFF and partner in crime. Here’s to always telling me like it is, making sure the ‘girls’ look good, awesome adventurous road trips and really good wine!To Glenda: For being a pioneer in our industry, and guiding and mentoring so many through the years. You give so selflessly of yourself and your time. I’m blessed to have you as a friend.To Deb: for being an amazing leader for ADCAN! You’re doing a great job! To Myrna: For being a great friend, an inspiration, a role model to so many, and an awesome momma to Lucas! To old friends and new friends, thank you for the gift of friendship and nanny sisterhood! Happy NNRW 2014 to every nanny! So many of you have been part of my nanny professional life over the past 24+ years. Thank you for your friendship, love and support which has kept me going and growing. Shout out to Kellie, Alice, Glenda, Karen, Greta, Marcia, Sue, Charlotte, Janice, Tracey, Marni, Michelle, Myrna, Tonya, Deirdre, Gael Ann, Anne-Marie, Juliette, Cindy, Brandi, Mallette, Monica, Connie, Susan and Kathy. Each of you has had an impact on me, on your fellow nannies and on the industry. Without you and so many others I didn’t name the professional nanny wouldn’t be where we are today. Glenda – Thank you for everything you do. I really appreciate being able to go to you with any problem big or small and know you will “get it”. Carli – You have become such a dear friend to me. I talk to you almost daily and look forward to the day when we actually get to really meet live and in person. Thank you for helping me run wwn and being awesome in general!! Jenn F .- My real life friend I met through wwn. So glad we became friends. Thank you for helping me and Carli with the daily running of wwn I really appreciate all your help!!! Happy NNRW to all of you amazing nannies out there! Every year my circle of nannies who are near and dear to my heart gets bigger and every year I worry that by naming names I am going to leave someone out. Connecting with other nannies has been such an important of my professional growth and I am so excited to have finally connected with some other St. Louis nannies that share my love and commitment to this profession. Judy Wilde, Marseille Larkin and TJ Kinlon…..thanks for the connection! Melissa Nercessian….you are such a blessing to me…I am so glad that Nanny Transitions brought us together! Becky Kavanagh….you have made such a difference in our industry in so many ways and you have been an inspiration to me. Marni Kent…..you are THE Nanny Mentor….but you are also my dear and treasured friend. Myrna Alphonse Newman…..thanks for being a beautiful example of a strong woman. You wear many hats and you wear them well. Deborah Brown…..you are a fighter, you are a survivor and you are so loved by so many! Beth Lehmann….you give and give and expect nothing in return. You are one of my “sheroes” and you make all of us better people! Anne Marie Stanley, you are one tough cookie…I hope your determined spirit has finally found you a wonderful family. Donna Robinson….I have known you for all these years but now I can honestly say we are friends. So happy for that! Kathy Webb….you are an honorary nanny for all you do for all you give and for all you have done! Thanks to Tonya Sakowicz, Michelle LaRowe Conover, Andrea Brocklesby, Deirdre Bellows, Karen Yatsko, Jenn Gay,Beth Lehmann, Tracey Chipps,Gael Ann Dow, Buffi Gentry, Shelly Buller, Amelia Georgiana, Kim Smith, Kim Peters, Row Smith,Greta Schraer, Marcia Hall,Christy Ochs, Juliette Worley, Cynthia Wilkinson, Brandi Hylton Brewer,Valarie Gauntt, Stacie Gebeke, Lisa McCormick, Carli Litenmouth, Susan Fordham for your years of support and friendship and Kristen Kanoski……we carried each other a long way. ​All the former INA NOTYS that are my friends, my colleagues and my mentors…year after year you continue to amaze me and you continue to have an impact on my life. Kellie and Alice….thanks for keeping Regarding Nannies going forward for all these years.​ I am so honored to have been a part of this great adventure. I know Greta will agree we are “birdies forever”. Each and everyone of you have had such a tremendous impact on my life. I would never have made it in this industry without your encouragement, your support, your laughter,your willingness to be part of the solution, your listening ear, and your great advice. Blessings to all who work to make a child’s life safe and stable. May you all be blessed this week because you give so much in the work you all do. Kenda Horst, nanny of 22 years in San Francisco. Thank you to Sue Downey , Kellie Geres and Alice Shaffer for all the time and love that you give to the nanny community. For continuing to supply us with great education opportunities I am forever gratefull! To Michele Whitesides, Melissa Doran, Joanne Garrletts, Taylor Augustine, and Lyssa Barns-Burnside thank you so much for being my go to nannies with help at all times. Also for being such great friends that are always there for me! Play group girls forever! To Myrna Alphonse Newman, I admire you and thank you for always taking time to give great advice! happy NNRW, just want to take a minute to say how happy I am to have gotten to know all of you♡ you all are amazing, caring, loving AND FUNNY ladies. Love all of you, just want you to know your appreciated in the nanny community AND as a friend. To the Metro Detroit Nanny Group! Thank you for being a wonderful agency owner and nanny! Thank you for helping me find a great job and for supporting nannies in our area! You ROCK!!! Thank you for being you. When I have a bad day you are there for me to just work though it. You are an awesome friend and a great nanny. Thank you for always being there especially when my job was changing! You are an awesome friend and a great nanny. I can’t say enough wonderful things about you. Though your job is crazy, you are always there for a good laughter and a wonderful story. Thank you for all the support and being a listening ear. You are great! You are always there for a good smile. Thank you for being there as support for me. Hudson is lucky to have you as a mom! Thank you for always being a listening ear and a wonderful person to talk to. Also for stepping up and helping me when I need it. I would like to thank someone that I met a very short 1.5 years ago, only met her 1 time in person, but feel as though I have known her all my life. She has helped me through many personal trials, professional problems and has also provided me many reasons to smile! Whenever we ‘speak” online, I always, inevitably come away feeling happier, lighter and more at peace than I did before we communicated. I wish everyone could be lucky enough to know my friend, Glenda Willm Propst. I am a better person, certainly a better Nanny and happier person because of her friendship. Through Facebook, I have reconnected with a lot of people that I have lost touch with over the years. I have also met, and become friends with, hundreds of people that I am fortunate enough to call my friends. One of these people is Lisa St. John. A group of Nannies (through Facebook) had formed a Nanny PenPal group. The person I was first matched up with never responded to my letters and, lucky for me, the same thing happened to Lisa St. John. I live on the West Coast and Lisa lives on the East Coast, but it seems as though only a few miles are between us. We have the same likes and dislikes, same sense of humor and have promised each other that when we are old and gray, we will become beach bunnies on the sandy beaches of Hawaii!!! Thank you, Lisa for being my friend, my ‘soul sister’, my penpal and…. (wait for it)….”squirrel”!!!! (personal joke)! To Glenda Propst thank you for being there when I needed your help. You were there to guide me when my mom was sick and helped me by giving me encouragement in my job search. Thank you for all you do. Happy NNRW. You were there for me while I was struggling with my job you offered guidance. When I was at my wits end you called me just to say Hello and listened to me while I talked. Never judging me in any way. Happy NNRW you are a true friend. Thank you for all the help you gave me throughout my job search and for listening to me when I needed a person just to listening. Thank you so much for helping me find my new job. You are an amazing person and a great friend. Happy NNRW. To all the other Nannies. Happy NNRW you all deserve it. A big shout-out to Erin Manning and Thaty Oliviera! These ladies worked tirelessly on this year’s National Nanny Training Day! And despite her jaw-dropping schedule, Thaty runs a weekly nanny breakfast club! Erin saved my sanity, nerves, and kids’ wellbeing by joining me for several days of a highly disorganized last-minute group childcare job I had committed to when I desperately needed additional competent caregivers. You are both my nanny heroes! 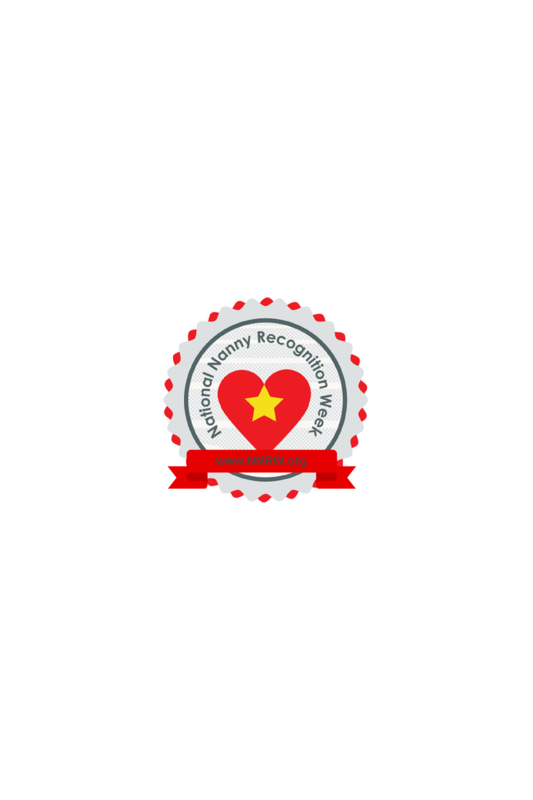 As always, loads of appreciation and thanks to the nannies who work so hard to give resources and connections to other nannies: Lora Brawley, Sue Downey, Glenda Probst, Tara Lindsay, Kellie Geres, Alice Shaeffer, and all other nanny group leaders and helpful bloggers who I don’t encounter so often. Thank you for paying your experience and learning forward.